Optimal would be if our DOFF's would just populate our ships. But I guess that's just to much to aks for. Ah yeah, and regarding my boff set. Yep, as soon as I get usefull space traits for Klingon Boffs I will do so. Having Klingon Allies as members of the general crews doesn't make a lick of sense. The Naussicaans, Letheans and Orions are mechs working for the KDF, not members of the Empire. The Gorn already have a large fleet and utterly hate the Klingons for conquering them. There's no reason any military commander would mix up Mechs and Nationalistic minorities in the Klingon Empire. Personally DAHAR MASTER COATS. 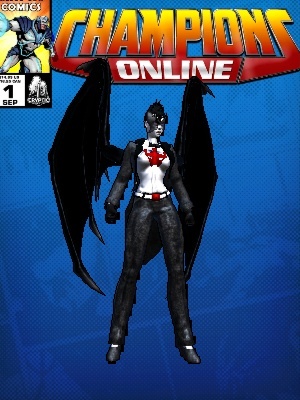 And some more uniform options. Besides that, and I know it won't happen, but actual separate missions from one size fits all after basically Nimbus III. Cardassian arc, bring back some of the old Cardassian missions like finding the Federation ship or stumbling on Tom Riker's son. In the Delta arc, have the 3 sides do different stuff. Federation does diplomacy, Klingons take the war to the Vaduaar, Romulans do Intel missions. But I know that will never EVER happen. We're talking Klingons here, science doesn't figure in the equation, only brute force. Not true. Without the scientists to research and the engineers to build, the warriors wouldn't have as many weapons to fight with. The Empire should honor their scientists and engineers. But they don't. It makes one wonder how the glorious Klingon Empire ever, literally, got off the ground. The original series Klingons seemed to appreciate technology, and were more even-tempered and cunning. Maybe the whole "honor! glorious death! Q'apla!" stuff was an evolution of their society as the technology advancements came to be taken for granted and a few writings of Kahless were held up over all the others. Similar to how the honor-driven Bushido code was essentially nonexistent in the feudal period but developed as samurai had fewer wars to fight and started writing poetry. But I think I know what the boys really want to see instead. yeah, a 3 meter tall, terrifying Gorn Female, with wings and a prehensile tail, and long slavering fangs. maybe blowing fire as she dominates the gorn males around her. I for one would love this. I get so annoyed when my Gorn has to play lip-service to those absurd Klingon ideals. OOOoooo... sign me up for one!! I am gonna name her: Gojira. I think they went with everyone do the same mission....when they decided everyone is on the same side. So they don't have to spend time doing multiple of anything. Going through the tutorial with Delta Recruits....it says there is supposed to be Career specific interacts inside missions. That went by the wayside, too. What would work: stand alone missions attached to different systems (like on the Federation side Patrols). They could make THOSE be stories about the origins (or history) of different races under the KDF Faction umbrella. Or maybe someone did that for the Foundry already??? It would be nice to have a search that was more robust in the Foundry. 2. Make it feel as though you're part of the racial society. Players don't feel as though they're KDF. I agree w/ the above, that the major races in KDF, need to distinct, and fully fleshed out. Give them reasons why the Orions, and such are actively involved. Also, why is the KDF allowing non-klingons access to their best/newest/top secret stuff? 4. Add an arc explaining the aftermath of rescuing Martok & his conversation w/ Kor. That would also mean an eventual Kor & Worf interaction. 5. In Klingon society, your house is everything. If the player is Klingon, which house do they belong to? Could they choose? How can this be used to tell a new & better story? What would the other race choices get, that would similarly add immersion? 6. Fed's seem to get the best ships, traits,etc and this needs to end. KDF factions needs to stop feeling neglected. 7. Adjust the dialog options, or at least explain why the player at such a low rank, is being given missions directly from the chancellor himself. In all, there is so much wasted potential w/ the KDF faction as a whole, it is truly disgusting. They should add to it, though. Its end sort of leads to nowhere. Another three to five episodes are certainly doable in that story, and they could combine the release with a Fehk'Ihri lockbox that also includes a T6 Kar'fi. Don't worry, it is coming. I think that got added along with changes for Iconian things...I think. Yeah, it was that far in advance of this Hur'q stuff was still on the back burner....but I think, they been planning to add any popular storylines and using it in some way for all players to access, eventually. Less work on them to come up with new stuff...unless it was bylines for marketing purposes in Dev Blogs. Interestingly one of the less talked about aspects of ViL is a minor rework of Ty'Gokor. The rework is very minor and actually removes the kiosk you have to run around when you enter the main area. The NPCs that were there got moved to stand by the hologram. The main thing i'd like to see is a revamp of the customization options for Letheans and Nausicaans. They don't look terrible. But when you look at their options it's kinda like they're incomplete.... also need females. just imagine a female Lethean in a bikini on Risa. They already removed the big desk as you walk in the door at the Qo'nos Shipyard and moved the ship requisition person to the ship display console. They did this at the same time as they moved some NPCs around in the ESD shipyard....and one of the Fed guys got demoted from being at a station at the desk to go stand by the windows. It is now empty except for the Orion Used Ship Salesman contact for the mission "The Hunt is On". Just standing facing the wrong direction in the middle of...nothing. LOL! Perfect place to stick Bank, Mail and Exchange terminals, now. They didn't make Vortas or Changelings or Female Jem'hadar models for a new EXPANSION. They barely have the Cardassians working right. I don't expect to see Female version of Letheans, Gorn, or Nausicaan added to the KDF list. I expect, they are going to continue on with the bad decision they made a while back of: everyone gets the same thing (or you get nothing at all). That was one of my complaints in that thread Borticus started. Everything in the game is now one big giant blob. Absolutely a huge bore. LOL! 1. more work on Klingon Empire subject races, racial missions for Lethean, Ferasan, and Gorn, racial missions for Orions. Not available to non-members of those races, to give an expanded selection in the Tutorial. 2. expanding on the Klingon Empire's internal politics, with relevancy added to activities that aren't appropriate to Federation or Rom Republic characters. (yes, this means PvP.) 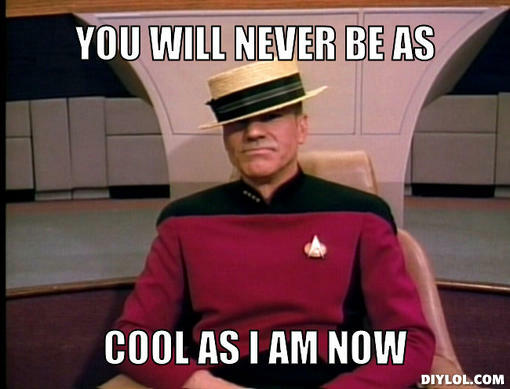 The KDF was originally released (incomplete) with the stated intent of being the token PvP faction, and Klingon culture is uniquely suited to a society that embraces duelling and resolves internal conflicts by shooting the other guy in the face instead of filing a lawsuit. I imagine the Klingon version of 'electoral politics' being kind of a violent version of 'survivor: Qo'noS', a mix of rabble-rousing, rioting, gladhanding and bribery salted with duels and assassinations. Something like renaissance era Italy mixed with 'Vikings' (the television show). contacts around Qo'noS for the various factions on-and-off the High Council, with agendas and specific reward paths that close off depending on who you ally with, and their own agendas for 'how to make the Empire GREAT again." 3. Specific enemies that only the Klingons are fighting. missions to the far side of the empire from the Federation, possibly even exploration or conquest missions for 'the greater glory of Your House' (pve centric stuff). 4. 'Canonize' a few really good missions from the Foundry, like "Krios Falling" and inject it into the Klingon War arc at lower level. expand the goings on away from rigidly following the Fed script, maybe make it part of a 'set' with second star to the right. 6. missions in the 'shared' arc gaining options to make use of Klingon 'tropes' like Cloaking, rather than being structured to force all players to charge in, in the open, like some Starfleet Knigget in his shiny Federation ship. options to bypass pickets if you have cloaking, and strike surgically. (you can always ladel on the armed opposition trying to prevent the clever Klingon from escaping once he's kakked the space-station/major asset). 7. can someone please shoot Kagran in the head? the guy's incompetent, with his frontal assaults on prepared enemy positions using inferior numbers out in the open. as a tactician or strategist, he's a complete and utter failure and needs a Klingon Retirement. 8. Gear-wise; Tier 6 for the T1-T5 (free) starships we've had since release, and updates to the ones we've got fleet (T5F) versions for. The point is to replace the 'shared' missions at lower levels than 60 except for the ones centered on Obisek/Romulan Republic's story tie-ins. But not 'completely replace' because that should be a choice your character makes, or relevant to which faction or 'house' in the empire they're aligned with (or some combination of those). the idea is to branch the storyline, instead of following a railroad path that makes your Klingon the best Federation officer in the Empire. Can we finally get a Transwarp option to Ganalda Station for KDF players? If there is one thing that is needed, it is that. •General equity with the Federation such as number of uniforms, ships ect. •Melee only challenge floor. Repeatable with much harder enemies. PVP and Co-Op option of this. Something I suggested to our Community Manager was hopefully they will FIX Gorn Very Rare Bridge Officer's. For the longest time Gorn's (Very Rare) Bridge Officers start out as a Purple, even though they only list but a single Superior Trait identical to Rare Bridge Officers, while a Very Rare is supposed to have two. Once added to your crew they again show as only a Blue Bridge Officer quality, likely because they only have but a single Superior Trait. 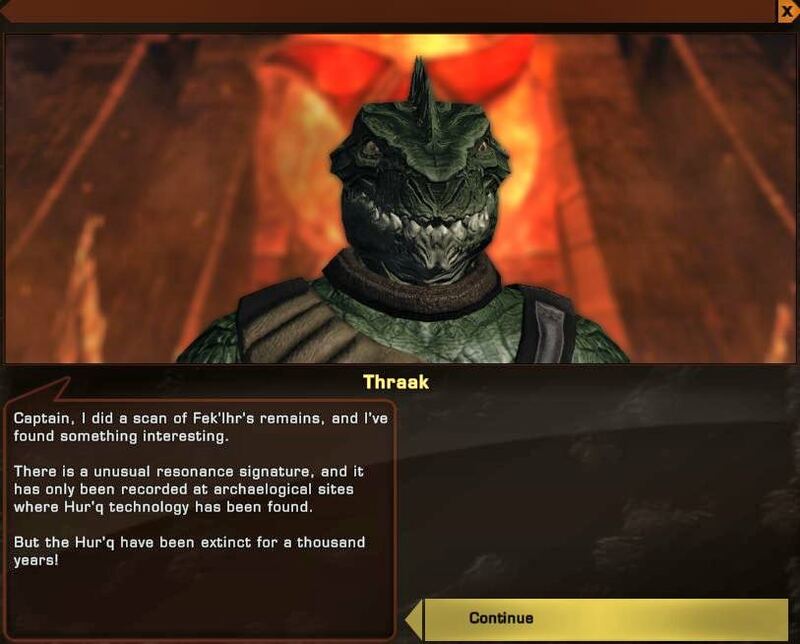 Yet if you have a Federation Captain who earned Level 4 in Diplomacy: Today there the only ones who can have a Gorn Bridge Officer (Very Rare) that has two Superior Trait's and shows properly as Purple. So hopefully they finally get that FIXED for Victory is Life. ...and then the geek activates the self-destruct remotely, sending the dishonorable thieves to Gre'thor. "THEY FIGHT!!!! If you want to challenge him or her in single combat for his or her station, go ahead. But when he or she wins, he or she may claim command of your ship as a prize. Anyone who serves on my ship must first pass the rite of ascension and earn their place as Klingon warrior." 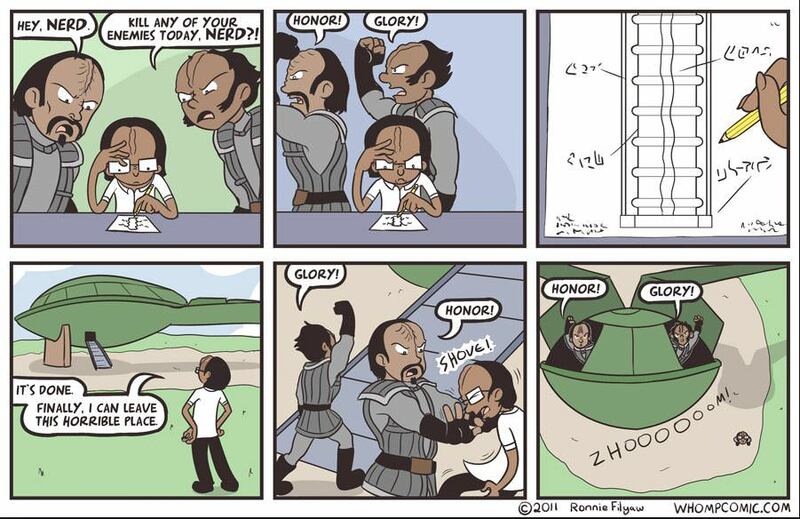 As for Klingon scientists, they are honored by Klingon culture, and this is canon. Beverly Crusher once met a Klingon scientist who was honored as one of the best. (She also shoved Crusher to the floor when she thought her honor was being challenged.) Any decent KDF strategist knows that science is a necessary part of space travel and space combat. Science was used to great effect by one of their strongest opponents, the Federation (and possibly others). Science is also needed in fighting new enemies, like the Borg and the Undine. I will concede that warriors may receive more honor, but science and scientists have their place in the KDF. There are a lot of great ideas in this thread, too many to list. I'll mention one, though. I love the idea of emphasizing the Houses. A character could choose a House, perhaps by doing a KDF only mission, or queue of some sort. The reward could be a uniform and a dagger specific to that House (bound to character, or course). This goes back to my old and often repeated request for the game to include daggers, and not just Klingon ones. I also want to say that the KDF being part of the alliance is fine, but remember what it was like when the Klingons were "at peace" with the Federation in canon. Even in the best of times, they were on the verge of war, and some of the houses wanted to instigate it. Oh, and I like the title of General better than Dahar Master, but that's just me. No recruitment officers for Doffs. Or they don't read the manual(which might not exist), thus accidentally blowing the ship up. Yeah, that is why I was saying: Fleet Starbase...which is right next door to Ganalda. It has all the Recruitment and Gorn/Orion/Nausicaan Personnel officers. But your fleet have to unlock them.